Alertness is just a few crunchy bites away. If you struggle to stay focused, Ambrosia apples are packed with nutrients to help. Even the act of eating the apple will also make it easier to concentrate. Many kids (and adults) are challenged with staying alert and concentrating. Whether it’s at school, playing sports, in a conversation, or even during play or leisure time, their focus just slips. There are a lot of things that may be responsible for this loss of concentration including fatigue, stress, hormonal changes or low blood sugar. The brain requires slow and steady energy in order to hold focus and concentrate. Ambrosia apples have both fibre and fructose. The fructose provides energy and alertness but the fibre slows down the delivery of that energy. This means that the increased energy will be sustained over time instead of it being a spike followed by a crash (often experienced with snacks that are sugary without the fibre). Extra fibre is found in the apple skin so keeping it on will provide the best balance of fibre and fructose. Helping someone mellow out might seem like the wrong thing to do when they are having trouble focusing. However, one of things that makes it difficult to concentrate and pay attention is anxiety and stress. Magnesium helps calm nerves and relax muscles. It also helps the body activate the B vitamins needed to produce serotonin which ultimately boosts memory and brain function as well as improving digestion and mood. A medium sized Ambrosia apples contains about 10 mg of magnesium. Fatigue is a major contributor to poor focus so the obvious solution is to get better sleep. However, that’s not always a simple feat. Ambrosia apples can help here too. In addition to the calming benefits of magnesium, apples lead to better sleep because they are a good source of vitamin C and potassium. Who knew that chewing crunchy foods had a positive impact on your ability to focus? Occupational therapists will often recommend that their clients have something crunchy to improve alertness. The oral sensory input triggers the parasympathetic nervous system to tell the brain to wake up and pay attention. It also stimulates a part of the brain that simultaneously helps the body calm down. So, eating crunchy foods, like Ambrosia apples, that require sufficient chewing (as they do when you leave the skins on) causes the brain to become more alert while relaxing the body. Ambrosia apples are also juicy which adds a sucking action to the eating process that, according to occupational therapists, further assists in boosting alertness. These are all great ways that apples help to combat focus issues but none of them will be effective if you can’t get your child to actually eat the apple! 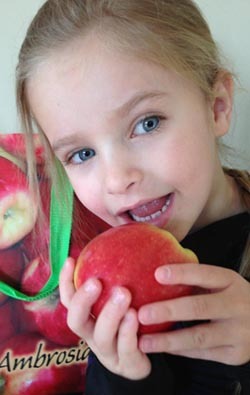 That’s why Ambrosia apples are such a good choice – kids really like them! They’re sweet, juicy and you can cut them up into snack size bites, pop them in a sealed container and they won’t be brown or mushy when recess rolls around.